During the 90 minutes, you will find yourself being amazed by the ancient city, visualising its castles and river channels, peering down its old laneways and getting a real understanding of the current shape of the city. 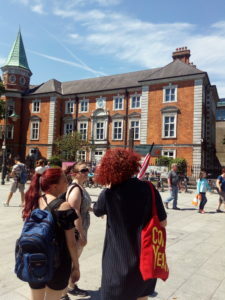 On this walking tour of Cork, we will bring you into Cork's back streets and ancient sites, and in no time at all you will know Cork like the back of your hand! And for sure we will have a laugh! This is a free tour, but donations will be gratefully received at the end of the tour. The tour is not sponsored by Cork City Council or any other businesses and so is completely unbiased. Tours are available by special appointment. Please email info@freewalkingtourscork.com or call 00353830371559 for information and bookings. From June onwards, tours will be available most Saturdays and Sundays, please check website closer to date or email me. School tours are also available by appointment. Starting point is at Daunt's Square outside McDonalds. See location. Failte go Corcaigh! 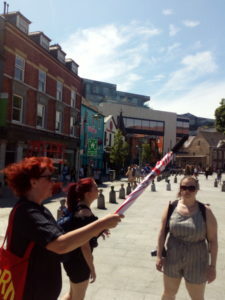 Welcome to Cork and welcome to the Cork Free Walking Tour. The name Cork is Corcaigh in Gaelic, and the original name was 'Corcach Mór na Mumhan', which means the 'great marsh of Munster'. 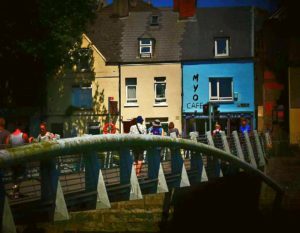 Cork city has a fascinating history, going right back to the local kings, the McCarthys, through to the settlement of Cork by St. Finbarr in 607ad, and on to the present day. St. Finbarr originated in west Cork and came to Cork city, where he founded a monastery on the site where Saint Finbarr's Cathedral now stands. This monastery, over time, developed a thriving university and people from all over Europe studied here. The city was then home to the Vikings, who came to Cork in the 10th Century and had a peaceful co-existence with the monks. The Vikings, or Ostmen, as they were known locally, built a fortification on the south island in the Lee, in the most ancient part of the city and this may have served as a template for the wall of Cork, which was built during the Norman era. The Anglo-Normans, from Wales landed in Ireland in 1169, and by 1171, Dermot MacCarthy, King of Munster took an oath of allegiance to Henry II of England. Prince John, Lord of Ireland, visited Ireland in 1185 and some time around that date granted a charter to Cork city which made Cork a corporate town with powers of local government. This status has been retained by Cork since that time and in 1985 Cork celebrated its status as a city for 800 years! The Normans constructed a wall on the south island of the Lee in 1182. Over time, this wall was extended and the entire medieval city centre became one of the greatest walled towns of Ireland. Some of this wall can be seen in Bishop Lucey park on the Grand Parade. While there were always people living outside the city the walls, the next area of Cork city to be developed was an area known as the Walkabout. This area bounded by St Patricks St, Cornmarket St and the North Channel of the River Lee was reclaimed from the river in the mid 16thC and fully built up by 1750. The area is now known as the Paul Street or Hugenot area. St. Patricks Street, or Pana as the locals call it, is now the main street of Cork city, but this street didn’t come into being until the late 1700s. The Wide Streets Committee developed the streets of Patricks Street, the Grand Parade and the South Mall to make them the majestic streets they are today. St. Patrick's Street was a river channel originally, and was covered over in the years 1774-89. It is now used by Corkonians how the residents of Barcelona use the Ramblas. In fact, in 2004, the city centre was revamped with the help of a Catalonian architect, Beth Gali, widening the paths, making more public places and putting in the impressive street lighting. That was done to celebrate Cork’s year as European City of Culture in 2005. • The English Market, a superb food market and cafe centre. It was first opened in 1788, right after this area had been reclaimed and developed. It was originally known as the Root Market. It was redesigned by Sir John Benson (remember this name!!!) and reopened in 1881. Unfortunately it was destroyed by fire in 1980 and had to be rebuilt, using the original materials including the metal railing and the fountain inside. Tripe and drisheen..., butchers, vegetables, as well as gourmet stalls, French cheese, East Cork smoked fish, Spanish olives, Greek olive oils, spices from India, teas from China, coffee shops and more. There are over 80 stalls. Queen Elizabeth visited in 2011, and had an impromptu walkabout on the Grand Parade. • Berwick Fountain, built in 1860, again designed by Sir John Benson. Sir Walter Berwick came to Cork as a magistrate, was well loved, was seen to be extremely fair in his judgements, and received so many compliments and well wishes on a promotion, that he was moved to present to the City and its residents this fountain. The 3 levels of basin are made from local limestone, masoned just locally in Douglas St, the largest of which is 22’, over 7 m, in diameter. It cost £150 but after just a year, and before its opening ceremony was so filthy and ‘full of filthy urchins’, that Sir Walter Berwick wrote to the mayor to ask him to remove it. It was subsequently cleaned up and formally presented to the mayor on 1 Jan 1862. The whole matter was of such embarrassment to the Mayor, he resigned the very next day! • Plaque showing us the house of General Tom Barry. Never believe quite everything you read, it says here he was born in 1898, but he was actually born on 1 July 1897, a brave soldier and leader during the War of Independence and in the Civil War. I will park that for now and we will discuss him and that time a little later. So now we are going to go into the heart of the old walled medieval Cork, head back in time 500 years, walk past where the 2 castles stood. These castles were called the King’s Castle and the Queen’s Old Castle and they stood by the river to defend the city. We will now walk up the old pier side, down what is now Castle Street, to the Main St of the then city. On the way I will point out the Cork Arms and the Cornmarket of Coal Quay as it is commonly known in Cork. The city motto, ‘Statio Bena Fida Carinis’ – A Good and Safe Harbour for Ships, it’s first known use is on a seal on a document 1498. North Main St and South Main St, also known at the time as Royal Street was a north-south axis of the old walled medieval city. • The Exchange Building, built 1705-1710. This housed the mayors, bailiff, tax collectors and courts. Justice was handed out and taxes and levies taken in. Remember we are very far from the main seat of power in the British Empire here, so it was very much run locally, this city is known as the Republic of Cork!! For over a century all trade was centred from this spot. • Originally the street would have had many lanes housing wealthy merchants and traders, records show 124 lanes. As the city prospered, the wealthy over time moved out to the suburbs such as Sundays Well and Montenotte in the 1700s and 1800s. • 1732, Edward Lloyd an English writer found that the shop in Main St were ‘neatly fitted and sorted with rich goods, from silk handkerchiefs, leather gloves, ivory combs. There were jewellers with gold watches, silver buckles and spurs; even hairdressing and wig-making’. This shows us what a prosperous place Cork was. • From records of 1787 there were over 120 types of traders registered in this area. From apothecaries to brewers, 50 drapers, 14 vintners, ship builders and chandlers, right through to 1 playing card maker. • 1851 – 70 of families in old city living in slums, cases of 7 people in a room, 18 in a small house. • Lane Plaque shows us two faces of a medallion, recovered during excavations at Christ Church, South Main Street, are illustrated on the plaque for Croun Court Lane. The medallion is known as a ‘Billie and Charlie’, that is, a forgery made by William Smith and Charles Eaton in London, around 1860. They put on the Cork medallion an 11th-century date in Arabic numerals, unaware that Arabic figures did not come into use in Europe until two centuries later. They dumped several thousand forged antiquities of lead and brass onto the market, deceiving the experts for many years. • St Francis Church. Plaque from High Cross of Mediaeval Cork. All the ancient maps show a cross right here. The earliest reference to this cross is 1578. The alley was named after the Crofts family, who are long established in Cork as the owners of Croft's shoe-shop on North Main Street. Records of the Crofts family in Cork City survive from at least the mid-17th century. Grave later of Thomas Croft dated 1789. The motif of two peacocks.The inscription ‘Sambu[ck]’ is a shorter form of S Sambucci baccae’, meaning ‘syrup of elderberries’. Picadilly Lane isn’t named on any published map until 1869. One of the few references to the lane is from the Cork Examiner of 20 October 1877, which reported that a commission on the Contagious Diseases Acts of 1864 identified a number of the ‘most vile and noxious dens in the city – dreadful for their inhabitants and pestilent to the surrounding community’. These ‘vile…dens’ included Picadilly Lane. St Peter’s Church Lane, or St Peter’s Avenue, obviously takes its name from the church still standing, although deconsecrated, on North Main Street. The earliest property listing for Cork City details two holdings on the lane – one belonging to William Galway and the other owned by Barnard Packinton in 1641. The entries tell us that Packinton was a ‘clerk’, possibly attached to the church. In the early 1700s one of the first parish schools in the city was built on St Peter’s Lane. During the 19th century, tenements were built along the laneway, The Cork Examiner (24 June 1871) recorded that tenements still existed in the city in the early 1870s, and that on St Peter’s Church Lane over 200 people lived in overcrowded conditions, describes these tenements as having been: … strongly constructed: the entrance to each house was through a small hall with two rooms at either side which were dark and small, with slabs for flooring. At the end of the hall, there was a narrow staircase leading to other rooms above – all equally small. The yard was also small – about 10ft by 6ft with one toilet and one water tap to serve the entire household. Towards end 19thC 40 lanes, only 6 >12foot, 1 just 3’11”. The late 18th-century church, described as ‘mean in the exterior, but elegant in the interior’ by a new zinc spire, built to the design of the noted Cork architect Paine, but this spire proved to be too heavy for the foundations and was subsequently removed again sometime after 1860. There was also a ‘copper weathercock, made by James Mangan’ which topped the 18th-century spire. The church is now deconsecrated and was recently renovated by Cork City Council for use as an exhibition centre. The graveyard attached to St Peter’s was the burial place for many of Cork’s most prominent families. Andrew Gallway’s will of 1579, for instance, requested burial in St Peter’s graveyard. Members of the Crofts, Tuckeys, Farringtons and Austens were amongst those buried there in the 18th and 19th centuries. In 1750, Smith, a historian of the time, noted some of the gravestones had ‘dates as old as the year 1500’, but the earliest surviving today are all of later individuals and families. Tuckey in April 1753 recounts the gruesome tale of Francis Taylor, who ‘was buried in St Peter’s Church-yard, and the next morning was found sitting up in the grave, one of his shoulders much mangled, one of his hands full of clay, and blood running from his eyes’– as Tuckey adds, ‘a melancholy instance of the fatal consequence of a too precipitate internment’. Skiddys Castle 1445, John Skiddy was a bailiff and later a mayor. Another family member, William Skiddy, was a mayor a few years later. Plaque to Terence McSwiney, born here 1879, died 1920, we will discuss him soon. • Coal Quay. This street was opened 1744. Originally a corn market. Then it became a market area known as the Irish market (Irish or Gaelic was spoken down here). Katty Barry was one famous stall-holder and many other traditional market families traded here. Even up until 50s and 60s, there was busy market area here. • Don Juan De Aquila, plaque. 1601 Spanish expedition led by Don Juan, landed at Kinsale, and captured it. They came to help the revolution against the English led by two family chieftains, O’Neill and O’Donnell. The revolution was defeated by Royal Forces leading to the ‘Flight of the Earls’ during which O’Neill and O’Donnell fled to Spain. Don Juan came up to the city where he was wined and dined and feted for several months. When he returned to Spanish Court he was ostracised and died a number of months later. Many revolutions took place in the 1700s and 1800s. The Penal Laws were enacted, which were very hard on Catholics: they couldn’t own property, couldn’t vote till 1792 and even then only if they had rental land >£2. Changes made from mid 1800s. Catholic Emancipation 1829. During the late 1800s there was a big demand for Home Rule. In the 1890s there was a Gaelic revival and Gaelic League was founded for language, as well as the Gaelic Athletic Association (GAA) for sports. In World War 1, there were approximately 200,000 Irish fighting for Britain; some for loyalty, some for money. Then came the 1916 Easter Rising, which did not have the support of the people. It’s 15 leaders were executed which then made uprising popular. 1919-1920 Irish War of Independence, much of the fighting in County Cork. Cork Volunteer Force. 1919 big election landslide for Sinn Fein. Thomas MacCurtain, head of Cork Volunteers, becomes Lord Mayor 1 Jan 1920, assassinated by British Troops 20 March 1920. Succeeded by Terence McSwiney (remember plaque). Arrested at City Hall and brought to Brixton Prison, died on hunger strike in 1920, 74 days later. Huge international publicity; 300,000 Brazilians alone signed one petition to the pope. Treaty signed July 1921 causing partition of Northern Ireland. Civil war, Michael Collins was pro-treaty. General Tom Barry’s Flying column (1920), remember plaque, fought in Civil War for IRA against treaty. Remembered as a brave leader and a brilliant soldier. 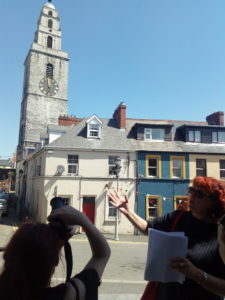 Now heading up to historical area of Shandon. We will cross the North channel of the river Lee. Pedestrian bridge, built 2004. In front of us Griffith Bridge, on the spot of Corks oldest bridge. Flooded and rebuilt many times. After one flooding, a ferry was instigated, fee 1/2d. Discontinued when bridge rebuilt. Bridge was fortified in 1620s, 1780s Arch bridge, 1860s Cast Iron, 1961 Concrete. Named after Arthur Griffith, one of the political activists of Irelands independent state, Irelands first unofficial president. Leading negotiator in the treaty talks. Site of St. Finbarr's monastic settlement in the 7thC. This cathedral that you can see, was built in April 1862, the Church of Ireland, in pursuit of a larger, more attractive cathedral, and determined to reassert its authority in response to a resurgent Catholicism, initiated a competition for a replacement building, which became the commission for the first cathedral to be built in the British Isles since London's St Paul's. The designs of the architect William Burges, were declared the winner of the competition to build the new cathedral. Burges disregarded the £15,000 budget, and produced a design that he estimated would cost twice as much. His diary records his reaction – "Got Cork!" – while cathedral accounts mention a payment of £100 as prize money. The spires were topped out in 1879. Shandon was one of 28 settlements in and around ancient Cork, and a medieval church dedicated to St. Mary was built on the site. Shandon is one of the more historic districts of the city, avoiding the fires and floods experienced by the newer developments and older parts of the city. The eponymous Shandon Street, originally known as Mallow Lane, was established by the Anglo-Normans, as a way to give access to North Gate drawbridge. So let’s return again to the 18thC, when Cork was the most successful port in the British Empire. All of the trades were booming, as ships stopped to provision up for long voyages. There was no refrigeration at that time, so site as last port of British Isles is most important. There was a big mercantile class of Protestants and Quakers which dominated the city both socially and economically. At this stage Catholics couldn’t vote or own land. 1780-1840 saw a huge growth in brewing, distilling, milling, tanning, gun powder, engineering, ship building, and provisions such as butter and beef. Agricuture was at the heart of all business outside of the city. There were big cattle farms in the Munster area. The first recorded exportation of Cork butter is to Spain in 1633. A butter market started here around 1730, originally an outside market. By 1744 Cork controlled 88% of Irish butter exports. The Committee of Merchants centred on butter. The butter exchange opened in 1769. Butter was graded into 6 classes, from 1st, termed ‘superfine’ , down to 6th, grease. The butter market inspectors were sent to different areas each day to avoid corruption. There were big penalties for poor judgement or corruption. Firstly, they had to determine quality and weight, then secondly report on the quality of packaging and detect signs of fraud. The market was open 24/7, as butter was coming in all the time. There were famous routes, known as butter roads, from East and West Cork, Tipperary, Offaly, Limerick, Kerry and Waterford. The Cork Butter Market building as it is now dates from 1849 and was designed by Sir John Benson. Shandon was the largest Shambles (open-air butcheries) in Ireland, and the Exchange was located within this commercial area. During the Exchange's peak in the 19th-century, Cork was the largest exporter of butter in the world, with butter exported as far as Australia and India. Trading peaked in 1880s, handling 500,000 casks of butter per year, valued at £1.5m, representing about £130m today. Firkin Crane built in 1852, deigned Sir John Benson. Circular design to aid collection of rain water for use in cleaning the firkins. A firkin was a small barrel, about ¼ size, held 25kgs butter. In this building the firkins were graded and weighed for export. Irish National Ballet and Institute of Choreography and Dance. Joan Denise Moriarty 1912-1992, founder of professional ballet in Ireland. Brewing. Beamish and Crawford (with 2 others O’Brien and Barrett who dropped out a few years later) founded 1792. Made their original money importing beer from London. Bought Allen’s Brewery on N. Main St which had been a brewery since 1715. By 1807 produced over 100,000 barrels per year. St Anne’s Church in Shandon was built in 1722 near the site of the St Mary’s of the. The steeple of St Anne’s was added in 1749 to accommodate the bells. The steeple has walls 7 feet thick, is 170 feet high including the spire, and is topped with a gold-plated salmon weathervane, eleven feet, three inches in length, to symbolise the salmon industry of the river Lee. The weathervane is known to local people as the ‘goldie fish’. The North and West sides of Shandon steeple are built of red sandstone, said to have come from the ruins of Shandon Castle. The south and east sides of the steeple are built of limestone which is said to have come from the ruins of the Franciscan Friary on North Mall which was also destroyed during the siege of Cork. In 1749, Mr. Riggs Faulkner and Mr. Carleton provided 100 guineas towards the casting of bells. There are 8 bells, first rang in 1752 to celebrate the marriage of Henry Harding to Catherine Dorman. The steeple of St Anne’s has four clocks, one on each side, each of them 14 feet in diameter. They were erected for the citizens of Cork by Cork Corporation in 1847 and were supplied by Mangan’s of Cork. The clocks continue to be maintained by Cork City Council. One of the clocks is inscribed with the following epigraph: “Passenger measure your time, for time is the measure of being”. The clock is known to locals as the ‘four-faced liar’ as each side of the clock typically gives a slightly different time due to high winds affecting the movement of the clocks hands. Biggest clock faces in Great Britain and Ireland until Big Ben (1859). Shandon Graveyard, many wealthy merchants including one of the Croft family (remember Crofts Lane), Thomas Croft buried 1789. Richard Skiddy and Richard Bretridge left trust fund for poor of Cork. Alms house built 1719, refuge for the poor for 250 years. Foundation 3 charitable institutions: the Almshouse, Green Coat School and the North Infirmary. The North Infirmary was built on the site of the St Mary’s Church that was destroyed during the Siege of Cork in 1690. It originally contained 24 beds, most of its patients during the early years were from the poor and mostly Catholic segments of society. The infirmary’s initial funding came from donations from the community, but population growth in Cork quickly outpaced this funding. In 1744 members of a musical society used their surplus funds to help expand the infirmary to allow 11 physicians and five surgeons to practice there. In 1836 the infirmary was redesigned by architect William Hill with an increased capacity of 90 beds. During the Great Famine it was used as a fever hospital for most of 1847. By 1909, the infirmary had increased its capacity to 115 beds; it contained a modern operating room, spacious wards and highly trained nurses. In 1917 the infirmary was used by military authorities to treat wounded soldiers sent home from the front lines during World War I. During the War of Independence, injured Republicans were covertly treated at the infirmary. It was closed in the 1980s, due to cutbacks in funding and as its design was deemed unfit for modern medicinal procedures. Mary Harris Jones (1837 -1930), known as Mother Jones, was an Irish-born American schoolteacher and dressmaker who became a prominent organized labour representative and community organizer. She helped coordinate major strikes and cofounded the Industrial Workers of the World. Jones worked as a teacher and dressmaker, but after her husband and four children all died of yellow fever in 1867 and her dress shop was destroyed in the Great Chicago Fire of 1871, she began working as an organizer for the Knights of Labour and the United Mine Workers union. From 1897, at about 60 years of age, she was known as Mother Jones. In 1902, she was called "the most dangerous woman in America" for her success in organizing mine workers and their families against the mine owners. In 1903, to protest the lax enforcement of the child labour laws in the Pennsylvania mines and silk mills, she organized a children's march from Philadelphia to the home of President Theodore Roosevelt in New York. 'Pray for the dead and fight like hell for the living'. The oldest building on this square is Starbucks – Queen Ann House (1720). Then the next oldest is what used to be the Cork Customs House, built in 1724. This building became home to the Royal Cork Institution in the 1830s and was opened as the Cork School of Design on the site in 1850. In the early 1880s, the Cork School of Design was extended with funds and patronage William Horatio Crawford, and the school was re-named as the Crawford School of Art in 1885. In 1979, the art school transferred to another site, and the Crawford building is now used primarily as a gallery and museum. The museum buildings were substantially extended in 2000. Across the river the former Cork Circuit Court (1885), which was originally built as a warehouse, by the Atkins family. The Drapery Shop dates from the same era, late 1800s. Obviously it was built as a fine townhouse, note the elaborate designs on the façade. The most modern retail development in the city is Opera Lane, 2009. Opera Lane was previously named Faulkner’s Lane, and it was named after Riggs Faulkner who owned a bank on the historic street in 1760. Sir Riggs Falkiner, (1712 – 1797) was an Irish baronet and politician. On 28 July 1768, an advertisement was placed in the Cork Evening Post, seeking banknotes which were lost in the city. One was from the Faulkner bank and was for £50, dated 15 April 1765, and a reward of five guineas was offered for its return. Then Faulkner went into partnership with Sir James Cotter, Charles Leslie, Sir Richard Kellet and Richard Kellet, see plaque with cheque. That concludes the tour, I hope you have found it informative and interesting and have developed just a little of the love that I feel for this fine city of Cork.